Guitar gallantry … innovative songwriting … soulful vocal styling’s … hard rock & blues tenacity … legendary artistry … these are just a few words that can describe the amazing musical genius of …ROBIN TROWER. This year marks the 40th anniversary of one of the greatest rock albums in music history. 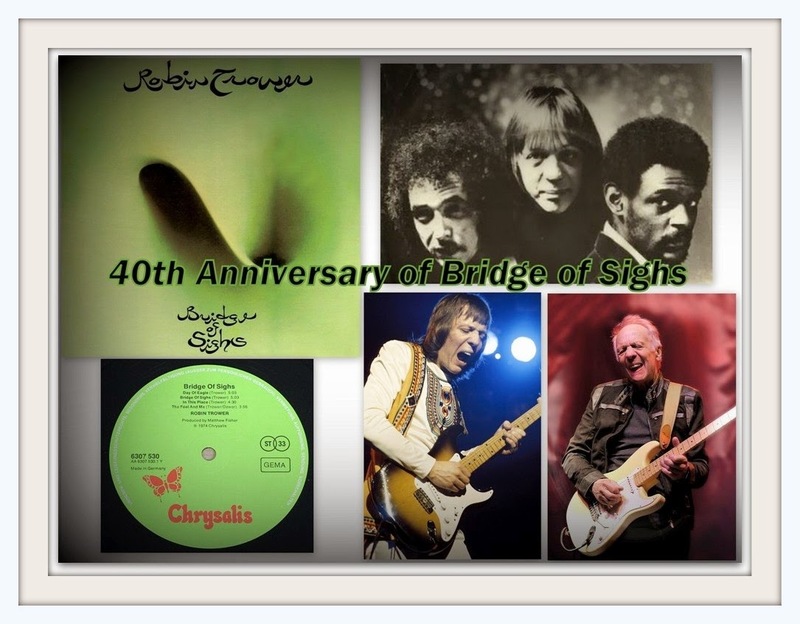 ‘Bridge of Sighs’ (1974) was only the second studio album released by the Robin Trower power-trio of Robin Trower (guitar and vocals), James Dewar (lead vocals and bass) and Reg Isidore on drums. It was this simplistic framework that musically overpowered many of their peers and lofted the band into superstardom. ‘Bridge of Sighs’ was recorded on the Chrysalis/Capitol label and reached #7 in the U.S. while staying on the charts for 31 weeks. That same year the album was certified gold. BRIDGE OF SIGHS: composed a mesmerizing and overwhelming sound mix of Psychedelic Rock, R&B & Funk melodies combined with lucid mind-numbing lyrical content. Most of the tracks were written by Robin Trower and James Dewar. The success of the album motivated many listeners to go back and retrieve Trower’s debut album ‘Twice Removed from Yesterday’ (1973) which also became a certified gold album. Both albums were produced by Matthew Fisher (Procol Harum) and also engineered by Geoff Emerick (The Beatles audio engineer). From the very beginning, Robin Trower developed a very unique style of his own. Trower’s ingredients include a heavy dose of hypnotic rock with Progressive, Blues, Acid Rock and R&B overtones. The metaphysical lyrical content was delivered by the commanding voice of James Dewar. The mesmerizing musical qualities of Trower and Dewar instantly transported the listener’s mind musically into other worlds and dimensions. Vocalist/bassist/songwriter James Dewar (1942-2002) was a rare musical gem and extremely crucial to the success of ‘Bridge of Sighs’ as well as all his recordings with the band and their live performances. The title of the album was believed to be inspired by a bridge located in Venice, Italy. The view from the Bridge of Sighs was the last view of Venice that convicts saw before their imprisonment. In my recent interview with Robin, I learned that the name of the album and monumental track came from an entirely different source. ROBIN TROWER TODAY: is back on the road again with a rather lengthy tour which kicks off on October 4th in St. Louis, Missouri. The Trower power-trio lands in St. Petersburg, Florida on November 12th at Jannus Live. For a full listing of Robin Trower concert dates click [HERE] or go to www.trowerpower.com for further information. To purchase tickets for the Jannus Live concert in St. Pete, Florida click [HERE] or visit http://jannuslive.com/ for more information. The Robin Trower travelling power-trio is …Robin Trower (vocals, guitar), Richard Watts (bass and vocals), and Chris Taggart (drums). Trower’s most recent album entitled ‘Roots and Branches’ (2013) will be supported on the tour. Robin Trower also has a brand new album coming out sometime at the beginning of 2015. The album will follow in the footsteps of ‘Root and Branches’ but all the tracks will be originals and written by Robin. 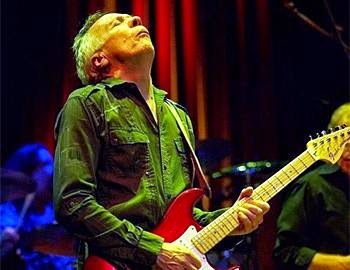 I had the great pleasure of chatting with Robin Trower recently about… The new album …The tour… ‘Bridge of Sighs’ turning 40 … James Brown … And much more! Ray Shasho: Hello Robin, good to hear from you again … beautiful weather here in Florida as always while we anticipate your arrival to Jannus Live in St. Petersburg for a live show on Wednesday, November 12th. Ray Shasho: The tour kicks off October 4th in St. Louis Missouri, who are the musicians that will be touring with you? Ray Shasho: How’s Davie Pattison these days … any chance of working with him again? Ray Shasho: Let’s talk about the new CD, when can we expect it to be released? Ray Shasho: Besides rock and roll & the blues, I know you’re a big fan of R&B/Funk/Soul music. In our last interview you stated that James Brown was one of your heroes … would you consider recording an entire R&B/Soul album some day? Ray Shasho: Your vocals on one of my favorite albums ‘Go My Way’ (2000) was strikingly soulful … especially tracks like “Into Dust,” I think you could definitely pull it off with amazing success. Ray Shasho: I was very saddened to hear about the loss of your wife Andrea earlier this year. Ray Shasho: Robin, I can’t believe it’s the fortieth anniversary of ‘Bridge of Sighs.’ It seems like yesterday when I bought the album right after its release in 1974. Ray Shasho: The album’s title and legendary track “Bridge of Sighs” has been speculated for years to be named after a bridge in Venice Italy. Apparently the view from the ‘Bridge of Sighs’ was the last view of Venice that convicts saw before their imprisonment. It’s also the name of a famous poem of 1844 by Thomas Hood concerning the suicide of a homeless young woman who threw herself from Waterloo Bridge in London. Was the title inspired by either of these circumstances? Ray Shasho: In my opinion, track per track, the “Bridge of Sighs” album is among the Top- 10 albums in rock history. Ray Shasho: James Dewar was my favorite vocalist; he was mesmerizing and just incredible to listen to. “Bridge of Sighs” has to be one of your favorites to perform in concert. Ray Shasho: I chatted with Randy Bachman (BTO) recently and he told me that he’s always heard music in his head. He was quite surprised that so many people didn’t share the same experience that he had since he was a young boy. Do you agree that musicians have that special gift? Ray Shasho: Robin thank you so much for being on the call today … we’re all looking forward to the brand new CD sometime at the beginning of 2015, and the tour which kicks off October 4th in St. Louis, Missouri. I’ll be there in St. Pete, Florida to review the show. Purchase Robin Trower’s latest CD ‘Roots and Branches’ on amazon.com and watch for his brand new release in the beginning of 2015.